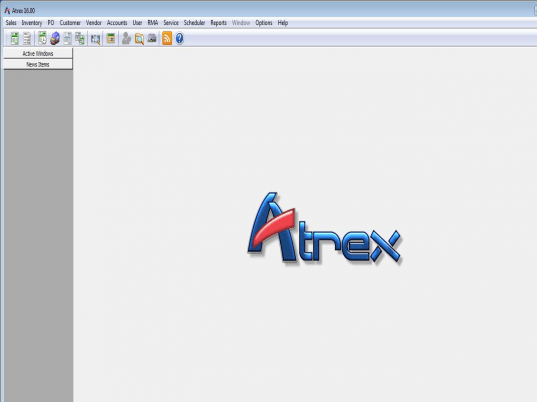 Atrex is software complete with easy-to-use inventory control and point-of-sale tools. It is meant for small business that wants to track and control stock levels accurately without spending a lot of money. Atrex comes with lot of features like invoicing, orders, quotes, recurring invoicing, purchase orders, service orders, AR, AP, and every other function that a retail or wholesale business needs. Other features include RMA (returned merchandise authorization) tracking, tax categories, pricing categories, over 85 reporting functions, partial searches capabilities for stock codes and customers, SQL query capabilities for ad-hock, on-screen reporting. GST support, international telephone numbers and postal codes, bar code printing, cash drawer support, and menu level security. The software Atrex also comes network ready and multi-user compatible, and includes context sensitive cross-referenced online help and a full users guide.